Last Thursday, Notre Dame Fighting Irish women’s basketball head coach Muffet McGraw held court at a press conference, fielding a few questions about her team’s upcoming games, but mostly defending her declaration that she would never hire another male coach. "I'm getting tired of the novelty of ‘the first female governor of this state’. ‘The first female African-American mayor of this city,’" McGraw said. "When is it going to become the norm instead of the exception? How are these young women looking up and seeing someone that looks like them, preparing them for the future? We don't have enough female role models. We don't have enough visible women leaders. We don't have enough women in power." The two minute clip has gone viral, shared by luminaries such as Barack Obama, launching a national discussion not only about women in sport, but about women’s rights in a country where the government has been unable to pass legislation against gender discrimination first proposed in 1972. 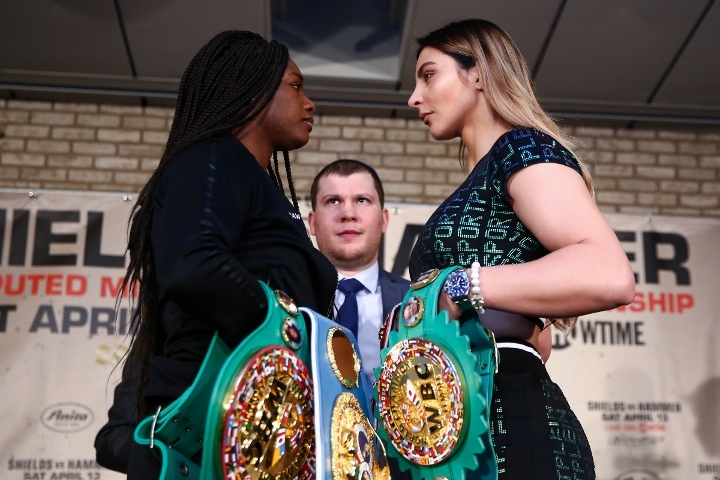 One week after the NCAA women’s basketball finals, Claressa Shields and Christina Hammer will do battle in what is likely the most significant women’s boxing match of all time, headlining a Showtime Championship Boxing program in a middleweight title unification bout. The most remarkable thing about Shields’ dominant run through both the amateur and professional ranks isn’t her laundry list of accolades and titles—it’s that a woman headlining a boxing broadcast in the United States now feels kind of normal. All but one of Shields’ eight professional bouts have been shown by a major American broadcaster, be it HBO, DAZN or Showtime. But women receiving any kind of positive attention in boxing is far from the norm. Boxing may show us the best in people—valor, courage and resilience—but as an institution and a business it can amplify the very worst in society. Beyond its base-level ability to exploit, it preys upon, encourages and welcomes all kinds of prejudice. As when it comes to women, boxing has been particularly wretched. If the deck is stacked against women in the world at large, in boxing there’s a crooked croupier dealing and a card counter at the table too. It’s not a world set up for Shields or other women to thrive in. It’s a world where writers and fans reached for their capes and rushed to defend Kubrat Pulev forcefully kissing Jennifer Ravalo, while remaining eerily silent about David Grayton pummeling a woman on camera. There’s a large, vocal contingent in boxing’s social media sphere who take aim at Shields in particular on a regular basis. Among some fans, she begets a different level of vitriol unique among active fighters. “It's important that she keeps being covered and that journalists of conscience fight back against the misogynists. Because every trope that Claressa is adopting—calling herself the greatest, affecting disinterest in the competition, being extremely partisan in her rooting and her analysis—are things that male athletes regularly do,” said Sarah Deming, whose forthcoming novel Gravity is inspired by Shields’ life. Several active fighters have demonstrated themselves to be actual deplorable people, and few fans are calling for them to be taken off television, as some do for Shields, whose main crime is to be confident in front of the camera. It’s one thing to root against a fighter, it’s another to wish for the eradication of their livelihood. “It's the gleeful, entitled tone of the trolling. You root for the downfall of the heel, but you don't root for their commercial failure. You only route for their commercial failure if you are offended at the broadening of the platform because it somehow annihilates you,” said Deming. It's important to remember that no matter how loud the trolls may be, Shields is winning the battle, much like she always has done in the ring. The hatred and vitriol on Twitter can’t drown out Shields-inspired mass market books like Deming’s, or Hollywood screenplays like the one Oscar-winner Barry Jenkins is working on (a rare boxing film not about a scrappy white, male journeyman). Boxing broadcasters, Showtime in particular, have been willing to give precious main event slots to Shields, which has opened the doors for a new generation of women turning pro, as well as those who came before but were denied on-screen exposure. Giving women prominent slots on boxing broadcasts is about more than just the Nielsen ratings or profits. It’s about being on the right side of history. With Shields winding people up online and sounding like a seasoned trash talker on the latest episodes of All Access, it’s easy to miss that the cause of women’s boxing is the fight Shields cares about the most. In February of this year, Shields was in attendance for a ShoBox event in Wichita, KS, both to call the undercard on UFC Fight Pass and promote her upcoming date with Hammer. After an interview with Steve Farhood, Shields sat ringside, ready for the camera to pan to her throughout the night. But during the opening bout she got up and walked to an empty table near the back of the venue and pulled up ESPN+ on her cell phone. Her Olympic teammate Mikaela Mayer was fighting Yareli Larios in Minnesota. For eight rounds, Shields screamed technical instructions at Mayer through her phone screen, unconcerned by who might hear. She could have been soaking up camera time and trying to become more famous, but she was in the back corner, supporting her sisters, fighting the more important fight. how many people here think Caressa "Maxi" Shields will win?